This week's Tuesdays with Dorie: Baking with Julia was hosted by Emily of Capital Region Dining and Raelynn of The Place They Call Home: Pizza Rustica. I'm not sure where this got its name. Rustic it is, pizza it's not. It's more like a quiche, but heavy on the cheese and light on the eggs. The base of the filling is ricotta cheese. Then you mix in some mozarella and romano cheeses, some parsley, and some prosciutto. I didn't have any fresh parsley on hand, so I subbed in 2 teaspoons of dried parsley. Also used cooked bacon instead of proscuitto, and asiago cheese instead of romano cheese. Sometimes a quiche tastes to "eggy" for me, so this "pizza" was more appealing to me. There were some mixed opinions among the group about the pie crust, which was very sweet. I decreased the amount of sugar in it, just a bit, based on comments that it was too sweet. In the end, I'm not sure if I liked this savory and sweet combination. I think cutting the sugar in half with this recipe would be absolutely fine. Thanks to Emily and Raelynn for hosting; you can find the recipe on their blogs here and here. Make sure you check here, too, to see what everyone else thought of this non-traditional pizza. Sorry your husband didn't like it...nice that you did:) My entire family loved it! It was so easy to put together too. Sorry this wasn't a hit for you - but at least the crust has potential for additional applications. 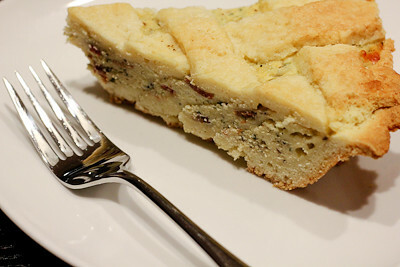 Ooh I had NO idea pizza rustica was more like a quiche than pizza. But this looks incredible!